These tomatoes. Ohhh, these tomatoes. I've had them bookmarked since long before I really knew who Molly was. Now, she's one of the food writers I admire most. If you don't know her, head over to Orangette. You'll feel like you've made a new friend right away, I promise. I keep kicking myself for waiting so long to try this recipe. I've had the best of intentions, with ingredients stocked and everything, to make this at least 3 other times. But for some reason, it's never quite happened until now. They were just as flavorful and comforting as Molly promised. I served them for company, but next time (probably not til next summer's first tomatoes) I'll make it for just us, so we can each have 2. 2. Cut the tops off the tomatoes. Holding them over a bowl, scoop out their insides – flesh, seeds, and juice – and let it all fall into the bowl. Set the tomatoes in a lightly oiled 9”x13” baking dish. Then fish the flesh out of the bowl, and chop it. Return it to the bowl with the juice and seeds. 3. In a medium saucepan, warm a glug of olive oil over medium heat. Add the onion, and cook, stirring frequently, until soft and translucent. Add the rice, and continue to cook, stirring, for another minute or two. Add the tomato flesh, juice, and seeds – it may look like a lot, but add it all – as well as the water. Tear the basil leaves into small pieces, and add them too. Add a generous pinch or two of salt. Reduce the heat slightly, cover the pot, and simmer for 10 minutes. Taste, and if needed, add more salt. 4. Spoon the par-cooked rice mixture into the tomatoes. Top them with a sprinkling of breadcrumbs. Give everything a good drizzle of olive oil. Bake for 1 hour and 15 minutes. The tomatoes should shrivel a bit and release some of their juices. 5. Cool for 15 minutes or so before eating, so that the tomato juices have time to settle. Oh yum. Those sure do look good =D. Oh wow! These look amazing. 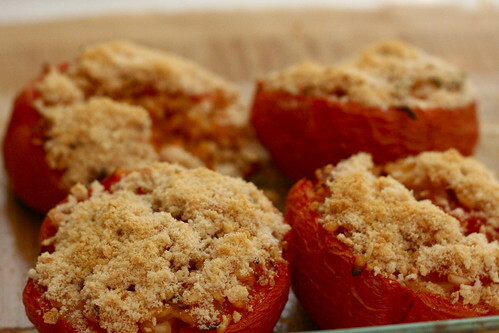 Those tomatoes look nice with the stuffing! I want to make some a weekend house party. Thanks for sharing. Added to list, though I'll have to buy the Arborio since I only have a long grain currently. Apparently it's good for Risotto and rice pudding so it won't be a unitasker.